By Amanda Tonoli | May 10, 2018 at 12:01a.m. A Fitch Falcon student shines in shoe repair. “I take any shoe that people think it’s time to throw away, and make it brand new,” explained Fitch 11th-grader Maeson Green, son of Bridgette and Moses Green. 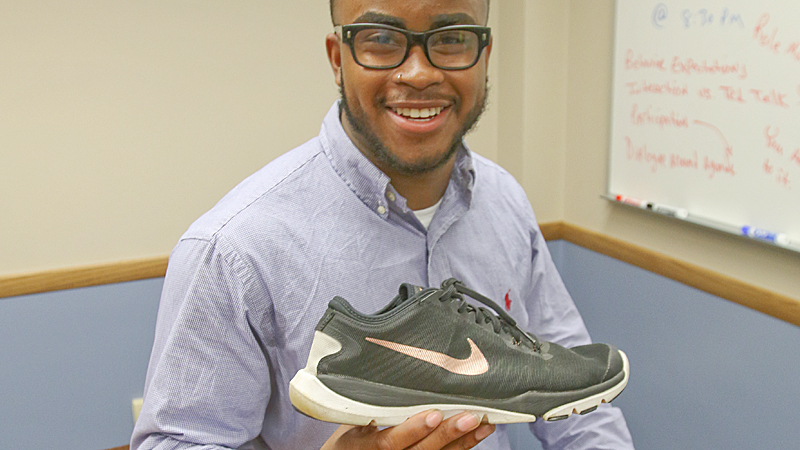 Although Maeson has always had an interest in shoes, his motivation stems from his childhood. Another motivator was a lacking in the field of shoe repair for fixing all shoes. “No one did sneakers and that’s something a lot of people wear nowadays,” he said. Maeson got down to business in eighth grade. Through an Austintown Community Connectors program, Maeson was able to learn from local entrepreneurs how to start and grow his shoe repair business. “I learned what goes into having a business,” Maeson said simply. For shoe repairs, Maeson said the cost is anywhere from $10 to $60 for services that range from cleaning to insole replacements and even waterproofing. His clients range from other students to even local lawyers and doctors. The wait time for a job to be done is a mere two to three days. Something Maeson learned is the difference between being rich and being successful, he said. “It’s always good to have a good amount of money, but you also have to care and want your clients to feel like family,” Maeson said. Moving forward, Maeson plans to attend college for business administration to continue his business with a possible minor in communications. “There’s just always something out there to learn and better yourself in,” he said. Maeson said he just wants other students who feel a desire to pursue their passions in entrepreneurship to do it. “I want them to know not to let what people say hold them back from doing what they want to be doing,” he said. For information about Maeson’s shoe repair, visit Mbgrestoring.com. November 11, 2007 2 a.m.